Braşov offers diverse gothic, baroque, and renaissance architectural styles; visitors will find themselves looking up, entranced by the artistic architecture and pastel-coloured buildings all around them. Braşov’s name means ‘crown city’ in both German and Latin and its coat of arms bears a crown with oak roots, which is evident on walls and buildings throughout the city. The city centre is lined with romantic cobblestone roads, with crepe stands and cafes lining Braşov’s wide, pedestrian-only boulevard. The city’s architectural highlights (below) should not be missed. Built in 1559, Ecaterina’s (Catherine’s) Gate, is one of the oldest portals in town. Complete with a drawbridge, and four corner towers, Catherine’s Gate was once the only entrance into the northern part of the fortress. Catherine’s Gate survived fires in 1689 and 1759 but an earthquake in 1738 damaged its walls. Closed up and used for storage, the gate was finally restored to its original state between 1971-1973, and is undeniably the city’s most beautiful gate. The inelegant Gothic-style Black Church peeks out from behind colourful baroque houses that shield the beautiful main square of Piata Sfatului and the former town hall, Casa Sfatului. Here, visitors can relax at an outdoor cafe while soaking up the ambiance. 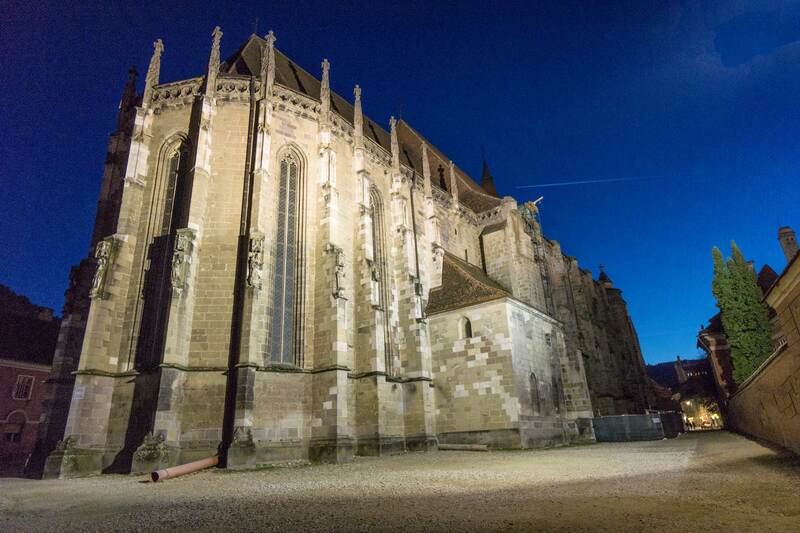 Built between 1383-1480, the Black Church earned its name after the smoke from a 1689 fire darkened its walls. Although the largest Gothic church in Eastern Europe may not be as striking as some Western European cathedrals, its gothic architecture and the Anatolian carpets that adorn the walls reflect the crossing point of the cultures and influences from the Ottoman Empire, the Kingdom of Hungary, and the Saxons. Following repeated raids by the Turks, Braşov’s residents fortified their city in the late 1400s, building thick stone walls with strong bastions, two outer watchtowers, and a citadel. On the opposite side to Braşov’s mountaintop sign, visitors can see the striking Turnul Alb (White Tower) and newly renovated Turnul Negru (Black Tower) which is, ironically, also constructed of white stone. In 1599 the black tower was destroyed by fire from a lightning strike, which blackened its walls, hence its name. Today, this pyramid-shaped glass roof tower is no longer black and houses a museum. Both towers can be visited and provide magical panoramic views over the city. The free Braşov walking tour is ideal for history lovers. This interesting two-hour tour covers 800 years of the city’s history including Romania under the ‘Golden Era’ of communism. 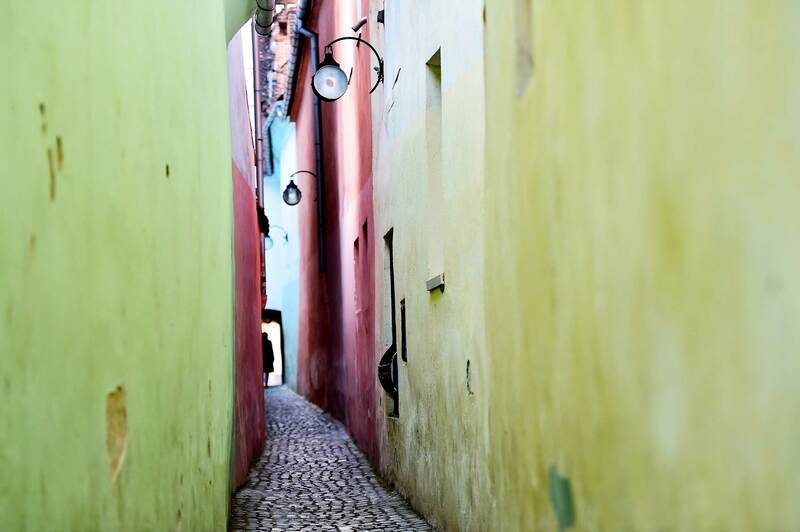 The tour includes a tight stroll down Strada Sforii — also known as Rope Street — which claims to be Eastern Europe’s narrowest street. This 13th-century alleyway is 135 centimetres at its widest point and just 111 centimetres at its most narrow point. The tour begins daily at 6pm, and is held in all weather. The personable guides meet visitors at the Piața Sfatului, the Town Hall Square, next to the fountains. While the tour is ‘free’, the guides work for tips; a tip of 5 euros per person is recommended, and well worth it. The city of Bran is just a 30-minute drive from Braşov, and is home to Bran Castle, also known as the castle of Count Dracula. Built in 1378, this wood and stone fortress served both protective and commercial purposes and had an essential role in protecting the Hungarian king from Ottoman and Tartar invasions. 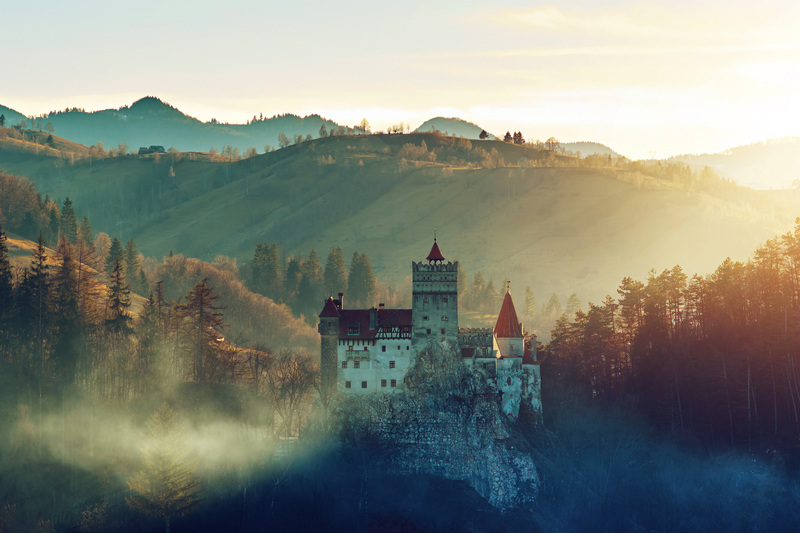 In 1920, Bran Castle was donated to Queen Maria of Great Romania, who lived there with the royal family until 1947. Since then, the castle has been converted into a museum. Castle tickets are 30 lei (8 euros) per adult. The uphill walk to the castle takes 10 minutes. While the attraction is child-friendly, the castle itself with its many stairs and turns is not stroller friendly. Lined with local shopping goods and souvenirs, and plenty of places to eat along the way, the village of Bran also offers tempting strolls along the street. The recently restored 14th-century Râșnov Citadel sits on a rocky hilltop in the Carpathian Mountains, about 200 metres above the town of Râșnov. For decades, this perfectly positioned citadel provided refuge for inhabitants of the area. It is a quick day trip from Braşov’s historic centre. For 12 lei adult admission fee (2.50 euros), visitors can access the maze-like inner rooms of the fortifications, a museum, a school, hundred-year-old stone houses, a skeleton buried beneath a glass floor, a few so-called secret passages, and sweeping views of the countryside. 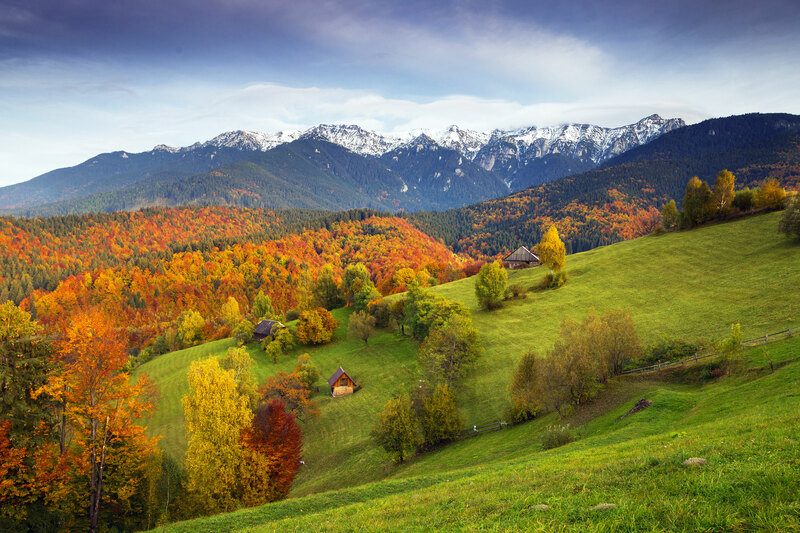 Just outside Braşov, towering mountains clad with thick forest cover the countryside. One of the most fun tourist activities in Braşov is riding the gondola to the top of Mount Tâmpa, which offers marvellous views of the city. For 17 lei per person (3.70 euros) visitors can purchase a return ticket; those hiking in one direction can purchase a one-way ticket for 10 lei (2 euros). Be sure to stop and admire the view of downtown Braşov, where the Black Church and main square can be easily spotted from above. Braşov offers many festivals throughout the year and they are well worth attending. Typically held in April, the Junii Braşovului festival (‘The Feast of the Youth’) celebrates the start of spring, with young men dressed in traditional costumes riding around Braşov. Later in the year, Braşov’s Beer Festival is a smaller version of Oktoberfest, where vendors sell beers, and tasty mici (grilled minced meat rolls) to the soundtrack of live bands and artists. Etnovember is held the following month and is celebration of the town’s cultural diversity, a portmanteau of the words ‘ethnic’ and ‘November’. One hour outside of Braşov is the little railroad town of Posada. 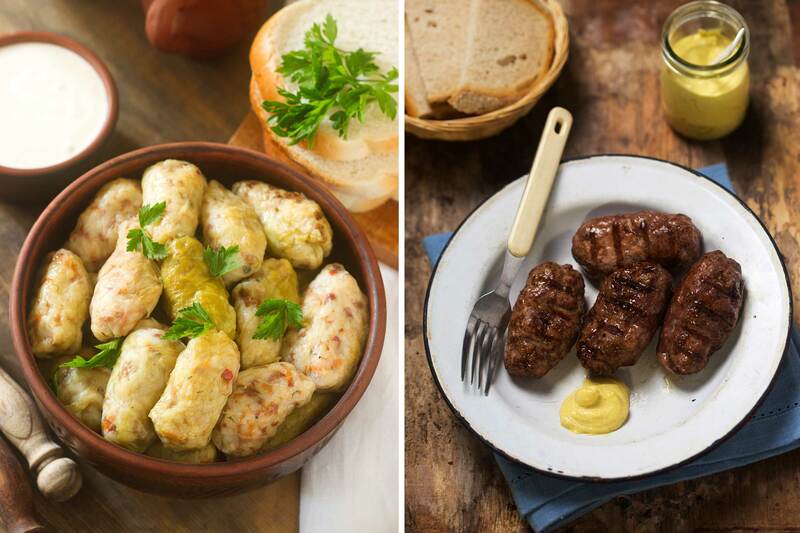 Enjoy a traditional Romanian dish such as cabbage rolls or smoked sausages with a side of cornmeal with salty cheese and sour cream at the restaurant called Cernica. In Braşov, grab a pastry from one of the many window stalls and find a table in the middle of the boulevard on the main street of Strada Republicii. For a wonderful brunch experience, choose from sweet or savory crepes at the laid-back La Republique while lunch or dinner at the stylish but still child-friendly pizzeria, Trattoria Pocol, is recommended. For an afternoon snack, the adorable bakery near the Black Church, La Vatra Ardealului, delivers strong cappuccinos and delightful tiramisu, cakes, and chocolate truffles. 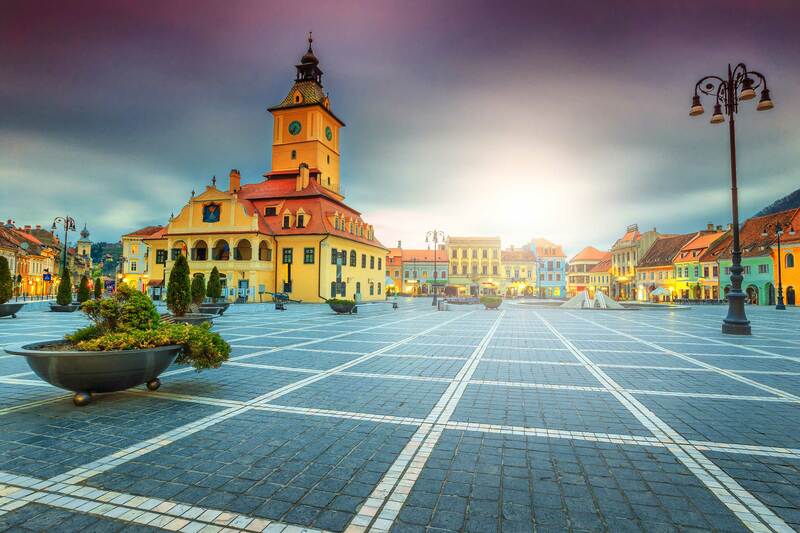 Often overlooked on the regular European tourist trail, Romania is a country for those who’ve seen all the major European cities and want to get away from the overcrowded tourist hot spots. It offers plenty of tourist attractions without the craziness of tourist groups, lines, and prices. 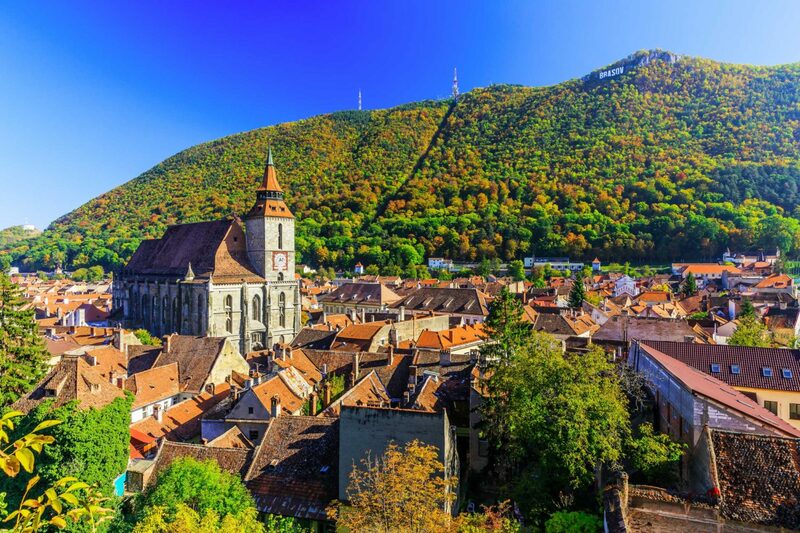 The rich history and sights in Romania’s soon-to-be major tourist destination of Braşov in the Transylvania region make a perfect week-long getaway. Three days are sufficient to explore all that Braşov has to offer, but for those wanting to see more of Transylvania, a few more nights can be easily added. With Romania’s population of 20 million nicely spread over 240,000 square kilometres, the country is perfect for a road-trip-meets-city type of adventure. Serviced by most major airlines, Bucharest airport makes an easy starting point. Sibiu International Airport or Aeroportul Braşov-Ghimbav airports near Braşov are closer options to consider. 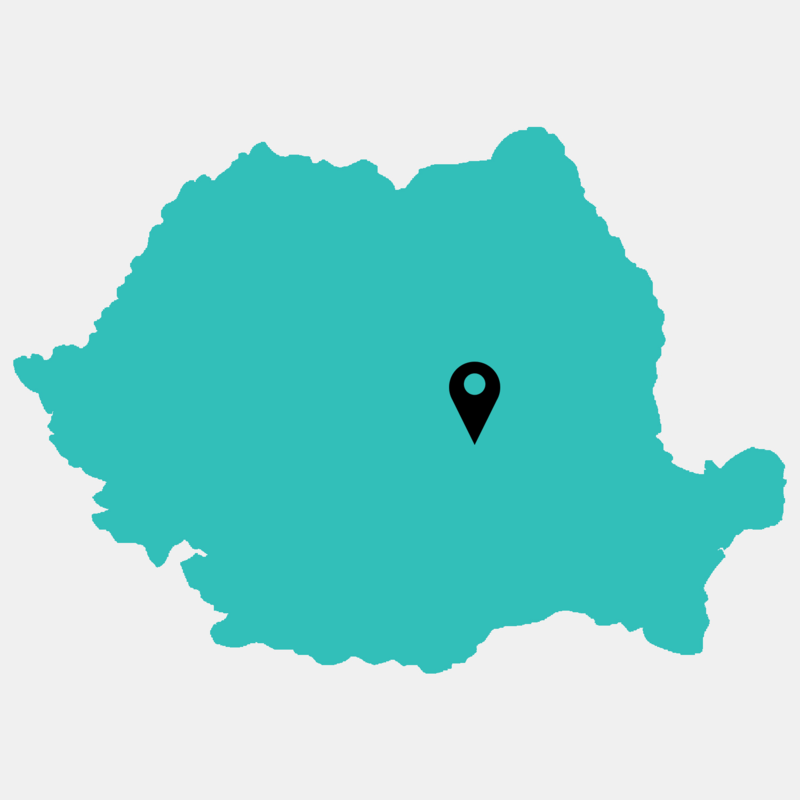 After landing, rent a car, purchase a SIM card with data, and head north for the 2.5-hour drive to Braşov. Romanian roads are easy to navigate and SIM cards help with GPS directions, and finding restaurants. 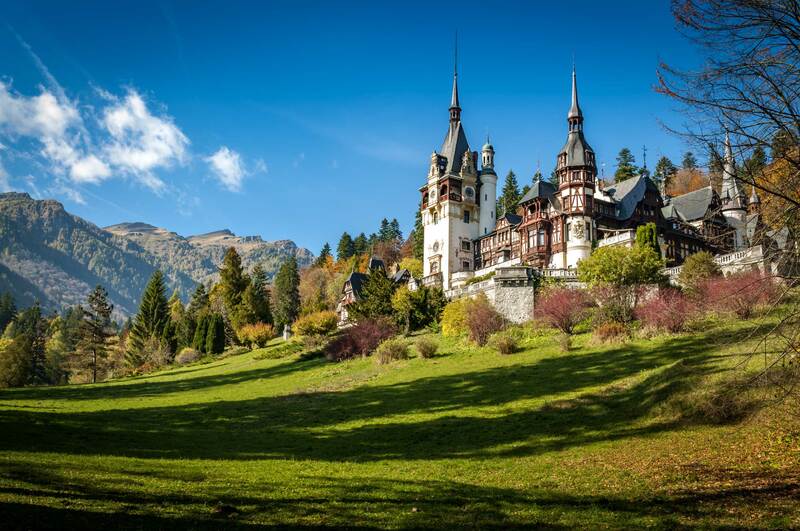 During the return from Braşov to Bucharest, explore the well maintained Peleș Castle, and eat lunch in the nearby city of Sinaia, which provides a cosy halfway stop. If driving in a foreign country is not your cup of tea, taxis, buses, and even trains between cities are easy to use and inexpensive as well. For large groups or those travelling with children, consider opting for a more family-friendly style lodging through private apartment rental. The summer months are generally drier and good for walking, but don’t be surprised by a rainstorm or two in June. In autumn, the trees and ground are splashed with orange, yellow, and red leaves. While winter weather can be inclement, holiday time in Romania invites guests to celebrate with locals still wearing traditional clothes while carolling, admire traditionally decorated wooden houses, and enjoy homemade sausages. Most shops and hotels will take credit cards but many restaurants, bars and smaller shops and outlets will only accept cash. Most people speak English, but a translation app is handy for reading Romanian menus. Purchase SIM cards with 3G data for 40 lei (8.50 euros). Download a map app to help with navigating the city. Take comfortable shoes — the best way to see all the cosy nooks in Braşov is by walking or cycling. Pack for all weather as even the summer weather can be unpredictable. Romanian currency is the leu (plural ‘lei’, pronounced ‘lay’). Often abbreviated to Lei or RON.